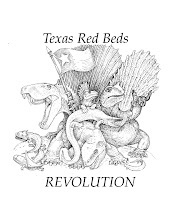 "Imagine you’re the star of the Red Beds, a big, bull Dimetrodon. You’re just lounging around the edge of a wide lake, on a sultry hot day near the present-day town of Seymour, Texas. Time: 285 million years ago. Worried? Nope. You’re the biggest, baddest predator in the ecosystem. A quarter ton of taut muscle and bone. All your neighbors on land fear you. Your saw-edged fangs can bite through any reptile’s hide. You’re the fastest thing on four legs – you have limbs longer and quicker than anyone your size. Suddenly, the lake erupts in an explosion of fins and fangs. 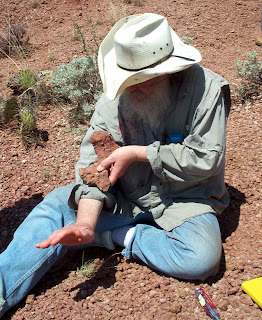 Great gleaming shark teeth slash through the spray..."
Dr. Bakker holds a Dimetrodon humerus found at the site to illustrate its location in this species' body. Like a scene from the Jaws: The Pre(history)quel, Dr. Bakker describes a scene we might have witnessed in Seymour, had we been there almost 300 million years ago. Dimetrodon fangs meet the sharp teeth of a Xenacanthus, a species of prehistoric shark that's completely unlike the species we know today. To begin with, they don't have a dorsal fin - so the situation described above would have been missing the obligatory Spielberg-ian music. "Complete Xena skeletons from Germany show a most un-sharkey profile. The body has no pointy dorsal fin at all. Instead, there’s a low, continuous fin extending from the back of the head all the way to the tip of the tail (with a slight notch over the bum). No shark alive today has that fin design." "The tail is long and muscular and strong but hasn’t a hint of a fork – the tail just gets thinner and thinner towards the rear and finally ends in a point. Xenas couldn’t generate the thrusts needed to accelerate into a great, long burst of speed, white-shark fashion." "Xenacanth teeth weren’t great, huge saw-edged fangs. The xenacanth chompers were tiny. Each one had two thin, sharp cusps, sticking up at and angle, plus an even smaller cusp between the two main cusps. That dental design is not for chopping up big victims. It’s for snagging small fry." 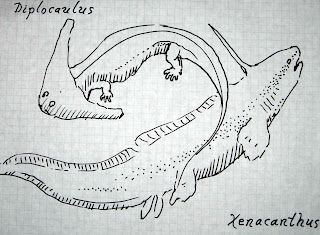 Field drawing of Xenacanthus with Diplocaulus, a freshwater neighbor. (c) Robert T. Bakker. Doesn't sound very threatening. So what makes Xenacanthus a shark? "The skeleton around the brain says so. Braincase elements are the most complicated sector of the whole skeleton, because there are dozens of muscles, nerves, arteries, veins and joints. And each major division of fish has its own way of designing a braincase. Take apart the braincase and put it back together. It’s built like a shark." So was Xenacanthus a Dimetrodon-slayer? Based on the evidence found by the team in Seymour, the answer is an emphatic no. "We find giant, saw-edged shed teeth all around the Xenacanth corpses in Seymour, and elsewhere in the same general layers. The biggest shed teeth are mighty daggers, fifty millimeters tall, reinforced with a central pillar of enamel and dentine, and sharp-edged front and back. A tooth like that could kill any xenacanth shark. The ballistic evidence is overwhelming – these shed teeth are the “bullets” left at the crime scene by the shark-eater." So, despite today's sharks' reputation as super-predators, Xenacanthus had a reason to be scared. "Shed Dimetrodon teeth are everywhere, including all the spots where shark skulls and spines are dug. The CSI evidence is undisputable – finbacks ate sharks, including big sharks." But Xenacanths were by no means defenseless. They had a potent weapon to fight back. "The Xenacanth head spine is huge...at the tip, the spine is smooth and ultra-sharp, so it would penetrate easily into the mouth of any predator foolish enough to grab the shark by the front end. It probably wasn’t a passive weapon. It has a strong, moveable joint with the head, so muscles and ligaments could have pivoted the spine around." 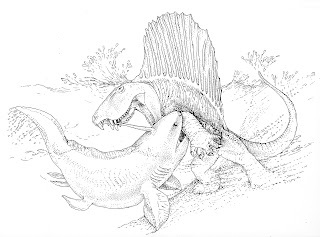 "Our big bull Dimetrodon is watching a Xenacanth, as it zips out to grab its prey. The big finback isn’t shark-wise. His hunting instinct kicks in. He can’t resist the temptation – The quarter ton reptile leaps with jaws wide open. He bites down hard to inflict the killing bite. A searing pain penetrates the Dimetrodon’s mouth. It’s like being stabbed with a red-hot poker. The finback staggers backward out of the water, rubbing his face into the soft red mud – the goop soothes the pain just a little bit. It will be a week before the swelling goes down. Next time he will treat Xena with respect." that would be a very epic battle, sometimes I wish to take a camera with me and travel through time, going back in Jurassic era and videotape some dinosaurs in their own environment. I think it would be the best documentary in history!